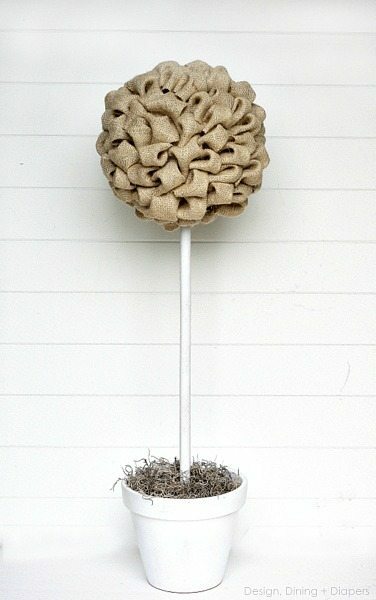 These Burlap Topiary Trees are relatively simple to make and can work for so many different occasions. I used them for my Winter Porch and plan on keeping them up for spring, they would also work well for a wedding or make smaller versions to use as centerpieces! I will warn you if you are a regular reader of my blog, these are probably one of my more pricey projects. I generally try to keep things as inexpensive as possible but once I got the idea in my head I just had to go with it this time! Start by spray painting the pots and the dowels in the satin white. Two to three coats may be necessary. Once dry, place a green styrofoam block in the bottom of the pot and then insert the dowel into the block. In the end, I added a few rocks on top of the block to make it more stable. Take the two Styrofoam halves and cut a circle in the middle to fit the dowel through. Thread the two pieces through the dowel and then secure them together by placing hot glue around the middle seam and at the top and bottom to make sure the dowel doesn’t slip. When I started these topiaries, I had a vision of what I wanted them to look like but I was struggling with how to make the bubbles until I landed on this Burlap Bubble Wreath by Today’s Fabulous Finds (her wreath is gorgeous, you must check it out). Janet had a very easy technique for making the bubbles so I decided to give them a try. 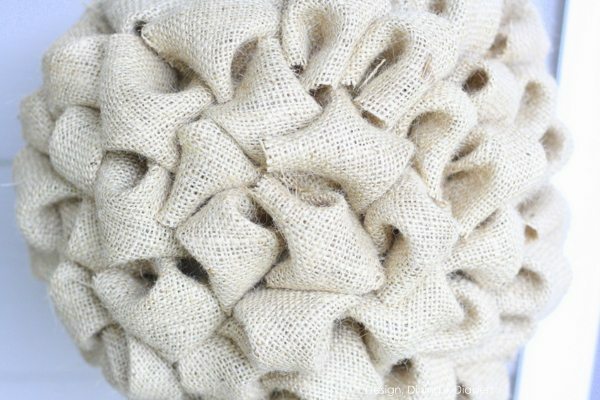 I cut my burlap into 4X4″ squares, then started to fold them into the bubbles by holding two corners together and then folding in the remaining two. It will create a little pocket. 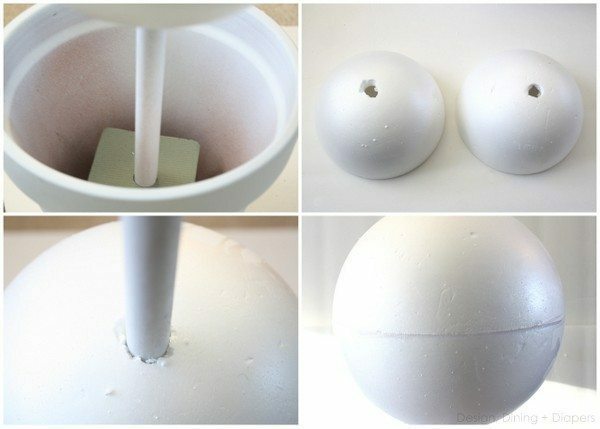 Then, using the straight pins attach each bubble onto the Styrofoam ball. Continue until the entire surface is covered. And here are how my Burlap Topiaries look on my front porch right now! So easy enough ya? Hope you get as much use out of them as I will! These are so cute! I need to do something to the porch- it’s sort of the neglected space since we moved in. 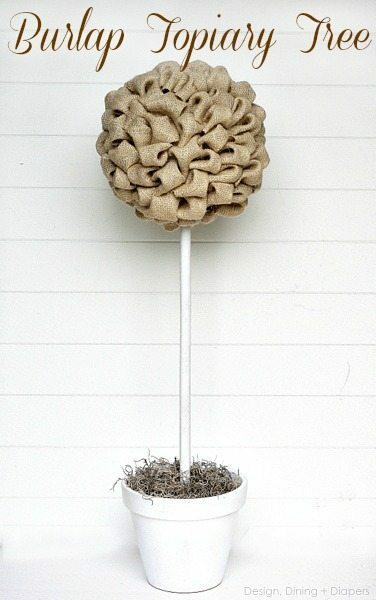 I am really into burlap right now, so of course I pinned this… I need a burlap folder for all my burlap stuff! 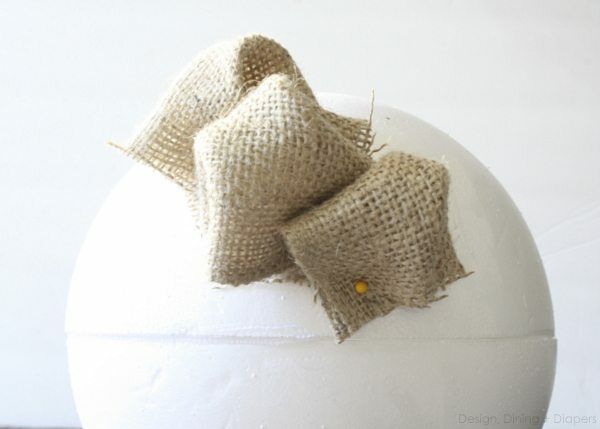 :) I saw the cutest burlap house mini flag yesterday on the PB site and I want to recreate it for much less. SO cute T!!! 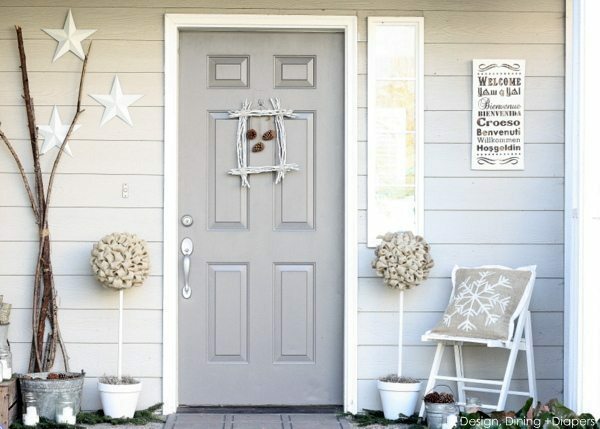 Your porch must inspire all of your neighbors! They must walk by your house regularly just so they can check out your newest projects, I know I would :) You are one talented gal! They look amazing!! 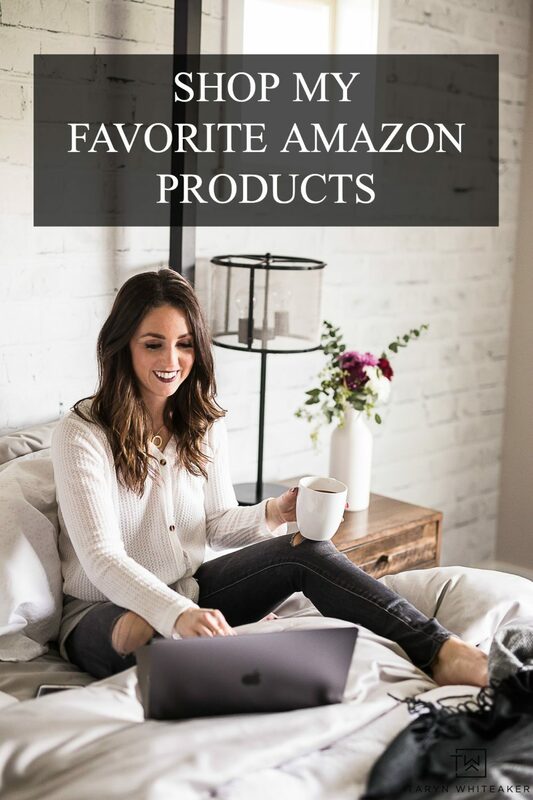 So excited that you shared this post! And burlap – I love anything with burlap. Great idea. Love your topiaries on the porch. Unfortunately no porches here in Michigan. Thinking the entrance way might need one. Hmmm! So cute Taryn! I love it! yay! I love your Topiary Trees (and your whole porch)! I have a little bitty porch, but I am totally going to do one of these trees! It will be nice to spruce it up a bit! I LOVE this so much! 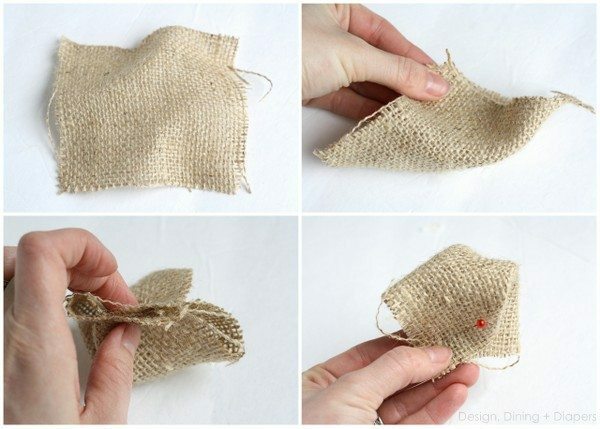 I have my eye on some printed burlap at Joanns – but I didn’t get it because I didn’t know what I’d do with it. Thinking I need to get some and make a couple of these with it! Have been looking for the perfect winter porch decor before spring hits. LOVE the topiaries…I have some electrical boxes I need to hide on my brownstone front porch so i’m thinking of trying a taller double topiary..
Oh how pretty. I love this project. thanks. These are super cute! What a fabulous idea. Such a simple idea too. I love this! I was drawn to just the picture, it’s so cute! I am pinning so I can come back later & make it! Thanks for sharing! These are adorable! Where I live, I’d have to anchor them in cement or they’d be in Kansas baby! I’m pinning this right now! Have a great week! Beautiful. I love topiary trees and this one is unique. May have to try to make this. Thanks for sharing. Visiting from sugar bee crafts. Oh they are like two little beauty queens sitting next to your door. So sweet! These look awesome! I also made a bubble burlap wreath. Now I can make companion topiarys. These are just amazing – wow – and what an easy project!!!! I want these on my front porch!!! love, love love your topiary trees, and they look beautiful on your porch! Great tutorial Taryn! These look so cool! And they’re so perfectly even all over. Beautiful! Love the topiary, and the porch! 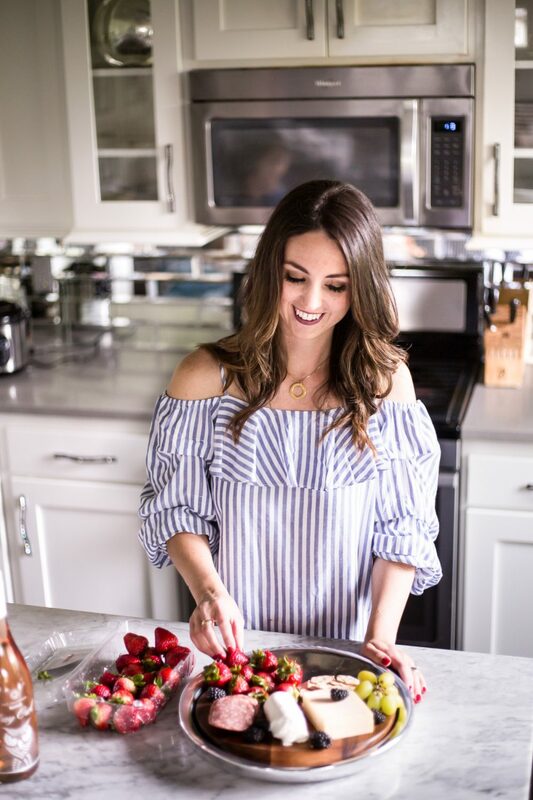 These are so dang cute, Taryn! You are seriously so creative! I never would have thought to even do something like this! A-M-A-Z-I-N-G!! I hope you link on my party!! I love these! Actually, I love the whole porch! This is really super cute! Love it. LOVE this! I want to make some for my front porch! Taryn, this is so cute. I shared it today over at Scribbles and Swirls. Thanks for the inspiration! Pretty and unique! 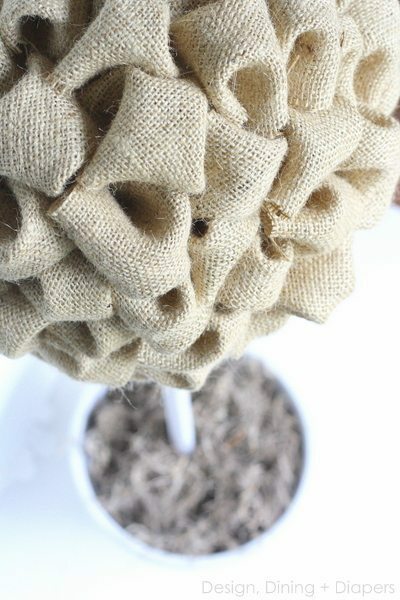 I love the simplicity and beauty of the burlap! Such a great tutorial! I just made a topiary using your tutorial! It turned out GREAT! I painted my pot and stick gold. Thank you for providing the tutorial so that I could make something wonderful also! I would like to make this but I just wanted to ask if there’s a reason you used the smooth ball versus the styrofoam balls? I want to know the color on the front door. Looking for that beautiful gray and can’t find it. I came across this tutorial in my wanderings thru Pinterest ….Love it! I’m trying a smaller one to begin. For the larger size, can you let me know the approx. size of the pot you used and the height of the pole you used? I’d like to get the basic dimensions for it to be eye pleasing. Thank you so much! !